For so many of us single people, we long for spouses. I can’t honestly speak for everyone, however, I know how I feel. I know that for as long as I can remember, I have always wanted to be married. Maybe that came from the Disney fairytales…you know the ones about the princess or damsel in distress who captivates the heart of some prince charming. We have Ariel who charms the human and gives up life in the sea to be happily ever after. We have Belle who falls in love with a mysterious man… more like a case of Stockholm syndrome. We have Snow White, Mulan, Rapunzel. Aurora, and so many other Disney fairytales that share with young kids- primarily young girls- about falling in love (usually at first site and at creepy young ages) with some “prince” who will fulfill them, meet all their needs, rescue them, or give them a castle. I mean, on one side of it, who doesn’t want to be treated like royalty, live in a castle, and have a handsome man/beautiful maiden by their side? However, what these stories do, though cute and enjoyable, is show such an unrealistic expectation of a spouse: that a spouse can fulfill and complete you. Don’t get me wrong, I love Disney and love the classics. But I want a real love story, not a fairytale. I don’t want a story that has me falling in love at 15 (I’m well past that!) and being taken away to a castle by some man I hardly know. I don’t want a story that has me relying on my worth and value and beauty through the opinion of someone else. I want a real love. A true love. A love that is for life. It is a such a myth…or dare I say lie…that we will be fulfilled, completed and made whole by getting married. Marriage is not about being made whole at all. Single person reading this: if you’re searching for love- for a spouse- because you think your life will be made perfect, think again. If you think that person will complete you because it is “so right” or “perfect”, you might want to think about being single a little while longer. Without a doubt, if you go and ask married people if their spouse is still completing them after 15 years of marriage, 30 years of marriage, or to their deathbed, they would tell you that marriage is more than being with the right person, more than being completed and more than a fairytale. Marriage is hard. Those vows actually mean something. When a spouse gets diagnosed with cancer, its hard on both of them. When a spouse cheats, its hard on both of them. When a spouse has an addiction, becomes distant, or wants something new….I guarantee you that marriage is not about completing anyone at all. Fairytales don’t exist. Covenant marriages do. As Christians, when we live our lives to honor God, he becomes our priority. He becomes the thing that we should love most. He should be your priority and your number one. If he isn’t, something needs to change. In my years of being single, I have learned that when I place the idea of a husband on a pedestal- like a Prince Charming- that idea, that man, becomes an idol and starts to replace God. Instead of letting the Creator, my God, fulfill my life and heal my brokenness, instead of letting the redemption that I received through Christ be my priority in everything, I allow for a man, a person, another failed individual, to take the lead. And that, dear friends, is a dangerous place to find yourself. If you are single, be in a place where God fulfills you, where he heals your wounds, strengthens you in your weaknesses, and gives you passion. I am not saying don’t desire marriage or a spouse. I am just asking that you keep things in the right place of priority. God first, always. Anything that comes before God is an idol, and that definitely can include a spouse. Married friends (and friends who want to be married), whether you’ve been married for a day or 60 years, keep God at the center. Keep Jesus as the thing your life fuels on. You will always blame your spouse for everything, whether right or wrong, when your life is solely centered on them instead of God. You’ll praise them for the good, and hate them for the bad. 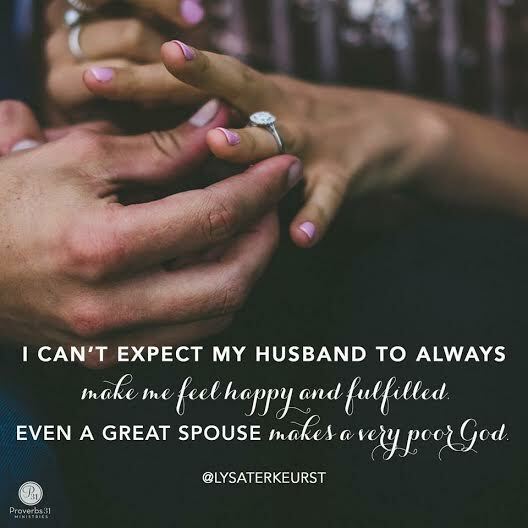 But when Christ becomes your center- your focus- where you both find fulfillment in and completion, then and only then, will your marriage be one that reflects a Gospel-Centered love. It is when you have this kind of completion and living out the Gospel in your marriage, that the world will want to see because it’ll be rare. Its hard, don’t get me wrong, but it is completely possible when Christ is the lead and center focus of your story. Don’t desire the fairytale, for it will only be a tale and not a truth. Desire a love that is so deep and so pure, that in spite of the failings and mistakes and heartaches that will come in a marriage, you can overcome. Desire a love that is made whole and redeemed through Jesus instead of each other. Desire a marriage that reflects the heart of the Creator, instead of Man. Find your wholeness, fulfillment, completion in a God who loves you more than your spouse ever possibly could. Isn’t that a story worth telling, far more than some child’s fairytale? Reblogged this on beyond the mundane.